US indexes continue to claw higher from the early August low of sp'1904. 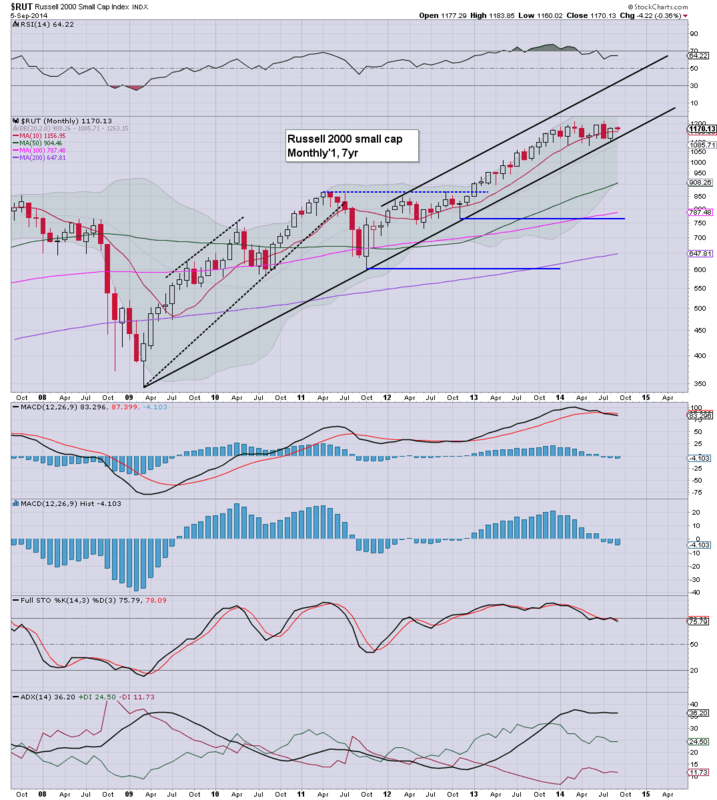 Since the key intermediate floor of Oct'2011, the sp'500 has climbed a monstrous 933pts (87%) higher. The market has seen just 8 net monthly declines out of the past 36 months, a ratio of 4.5:1. Thursday saw a new historic high of 2011, with a net weekly gain of 4pts (0.2%). Still, that gain made for the fifth consecutive weekly gain, with the early August low, now some 103pts (5%) lower. 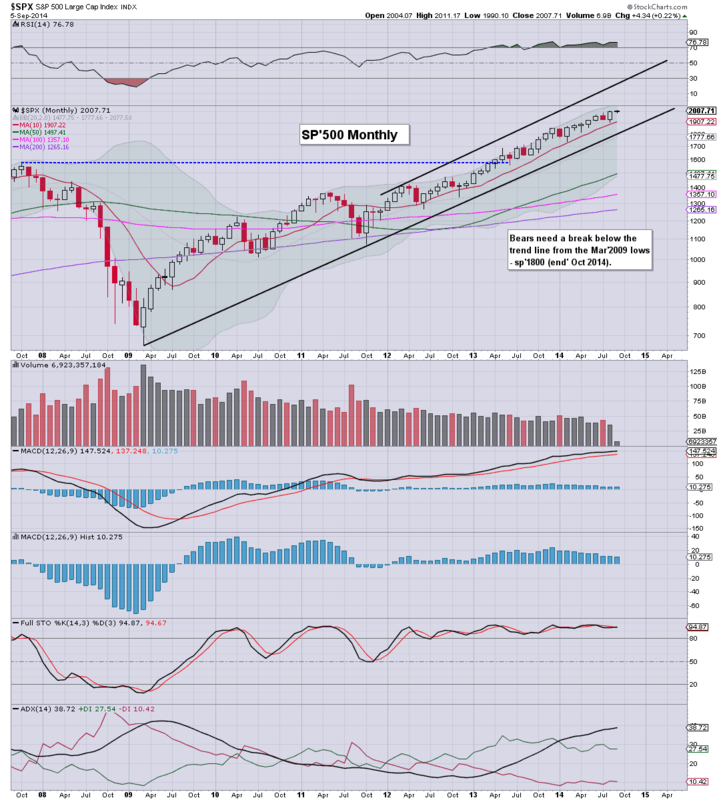 The broader monthly cycle remains 100% bullish. The 10MA has not been breached since Nov'2012, and even then, the monthly closing was a rather clear spike-floor. 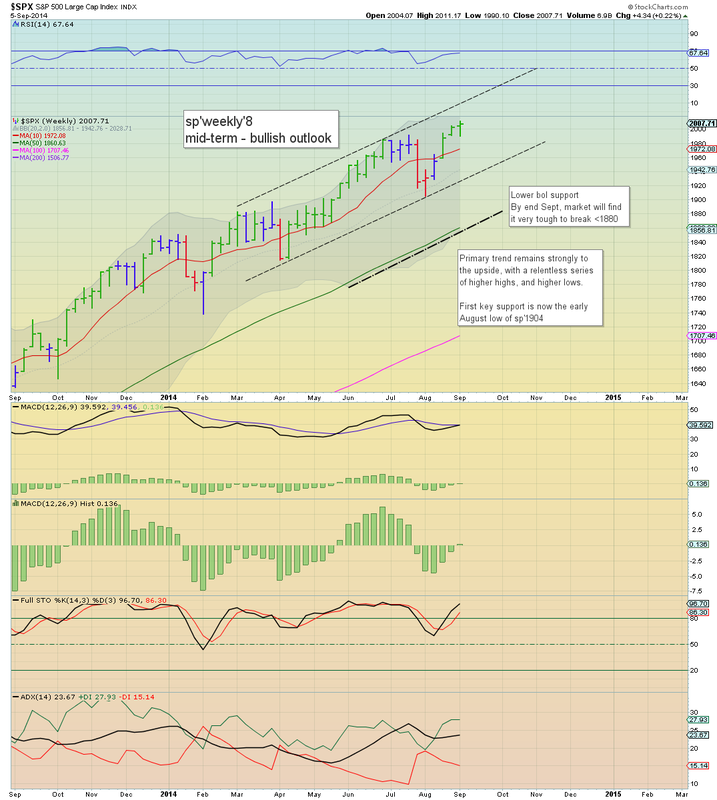 Upper bollinger is now in the 2070s... and by November, the 2100s will be 'best bullish case'. 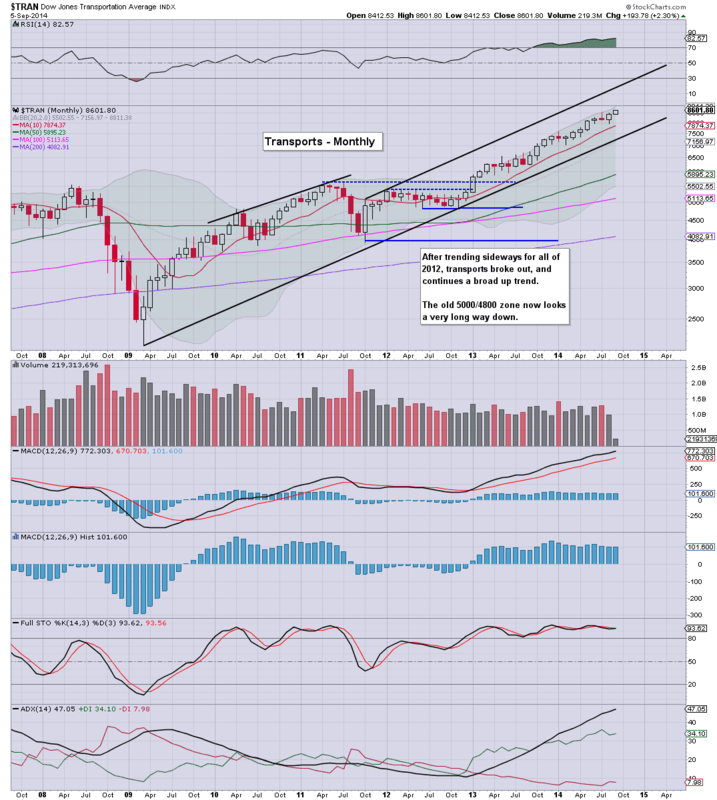 Underlying MACD (blue bar histogram) cycle remains bullish... there is simply nothing bearish here. The Nasdaq remains strong, and is a mere 550pts (roughly 11%) shy of the bubble high of 5132 from March'2000. MACD cycle remains positive, and there is no sign of a turn. 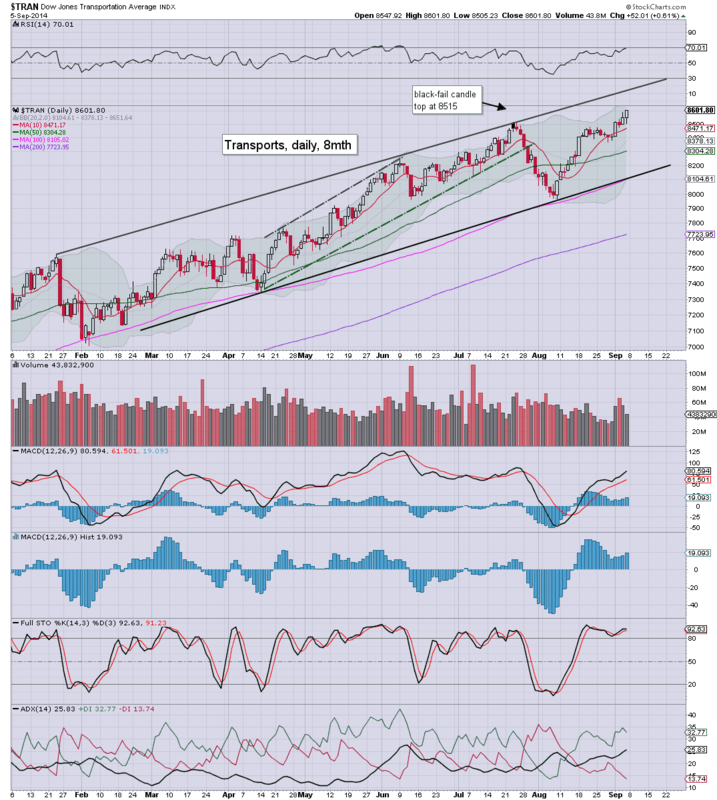 The mighty Dow broke a new historic high of 17161 this week, and looks set for the 17400/500s across the next few weeks. The 10MA has been periodically breached across the last few years, but so far... the down cycles have all been very minor. 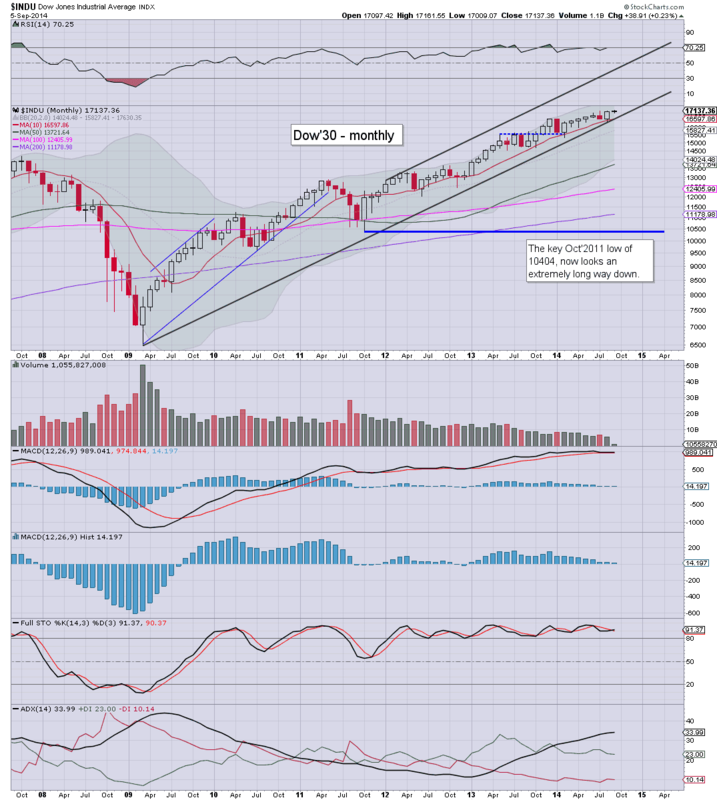 Equity bears need a decisive monthly close under 16k to have real clarity that a major trend change has occurred. By end year, the lower monthly bollinger will be around 14500/250, and that would appear to be 'best bear case' downside in an 'intermediate' down wave. The master index broke a new historic high of 11109 this week, and looks set for the 11300s this month. First key support is around the Aug' low in the 10500s. Any break under that would open up the low 9000s. 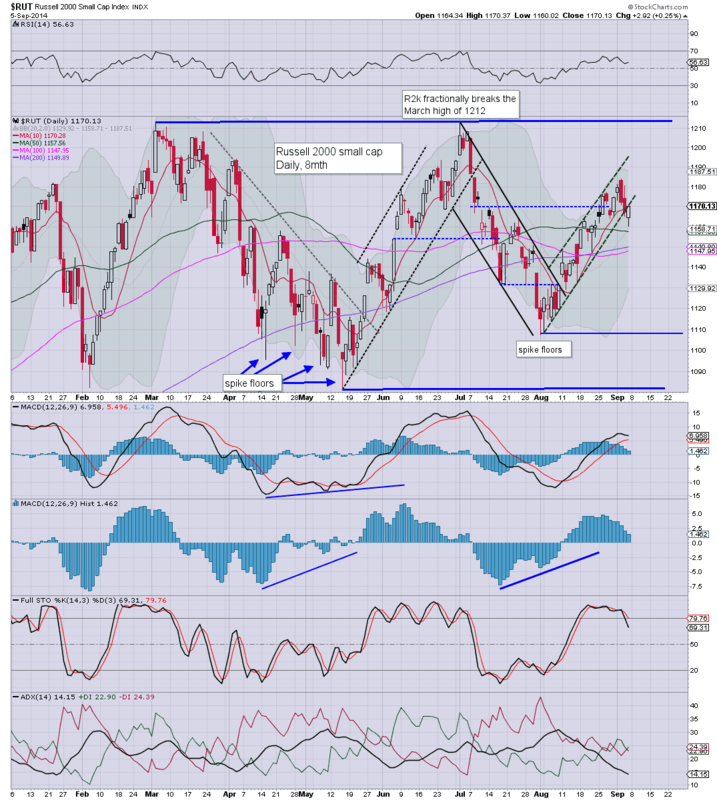 The R2K continues to lag the broader market, remaining stuck under the (arguable) double top of March/July of 1212/1213. Equity bulls really need a monthly close back in the 1200s this autumn, or there will be the real threat of another break below the key 1080 threshold. Rising trend from the 2009 low would suggest bulls need a Sept' closing at least above 1150. Underlying MACD cycle continues to tick lower, and is now negative for the third consecutive month. We've not seen this kind of momentum weakness since late 2012, but in price terms.. the R2K is effectively just trading sideways. 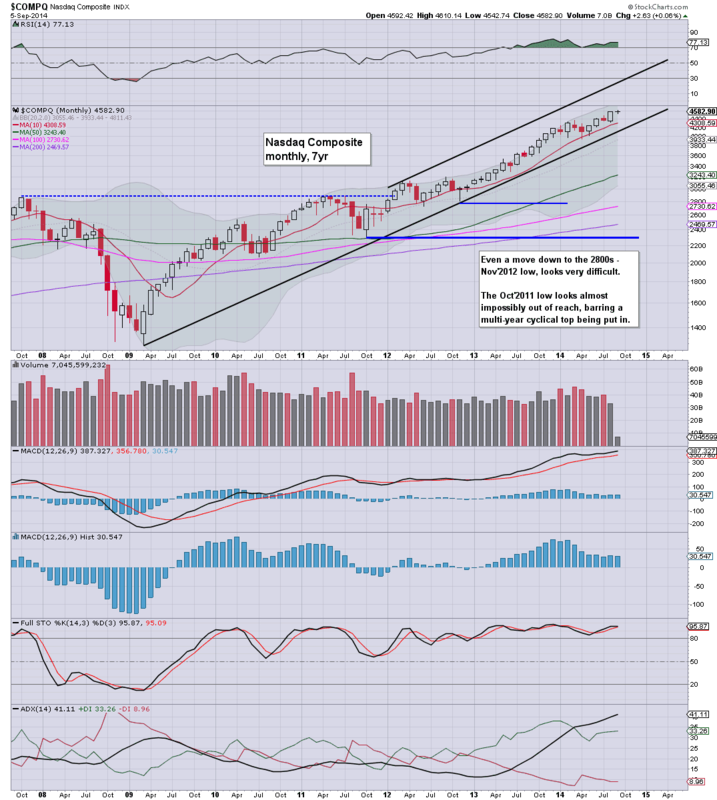 The 'old leader' managed to break into the 8600s this week, and is the most powerful sector/index in the US market. The 8700s look an easy target this September. Whether we can break to the 9000s in Oct/November... difficult to say. Without question, the broader trend from the key low in Oct'2011 continues. The market is still seeing periodic multi-week down cycles, but they remain very minor in size...and usually brief.. no more than 2-3 weeks. This pattern won't last forever of course.. as nothing ever does. However, for the moment, equity bears have nothing to tout, and bulls are merely seeing a relentless series of higher highs...and higher lows. Next week is set to be pretty light in terms of data points. This past week.. despite being a shortened one, was a difficult one for yours truly. Even though I've not been at all surprised at the continued rally from early August. What I do find difficult is keeping in perspective the bearish chatter out there. 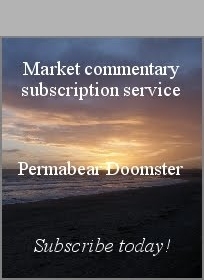 There are a fair few chartists and market commentators I regularly follow, many of whom are seeking a major intermediate down wave. The problem remains... we just keep on pushing higher. The primary upward trend remains intact, and unless we at least re-test the low 1900s in Oct/November...then I'll be resigned to the mid 2100s in early 2015. As ever, one day at a time, but there are days when I literally have to just turn off my screen.. and walk away. 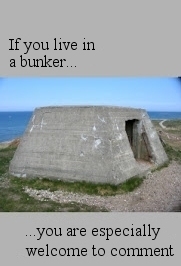 One thing I can say for sure... I will be here when the big turn finally occurs. US equities closed broadly higher for the fifth consecutive week, the sp'500 saw net weekly gains of 4pts (0.2%), settling at 2007. There looks to be upside of another 2% into FOMC/opex week. It was a pretty tiresome week, and personally, I've found it difficult to stay balanced. There is an awful lot of bearish chatter out there (at least in the online blogosphere), and it is often hard to filter out. Regardless, I am holding to the original upside target from early August... seeking sp'2030/50 zone, before the next multi-week down cycle. As ever, the only issue in the next down wave... will it merely be another higher low, or can we at least get down to the 1925/00 zone? As things are, we won't have that answer until early/mid October. 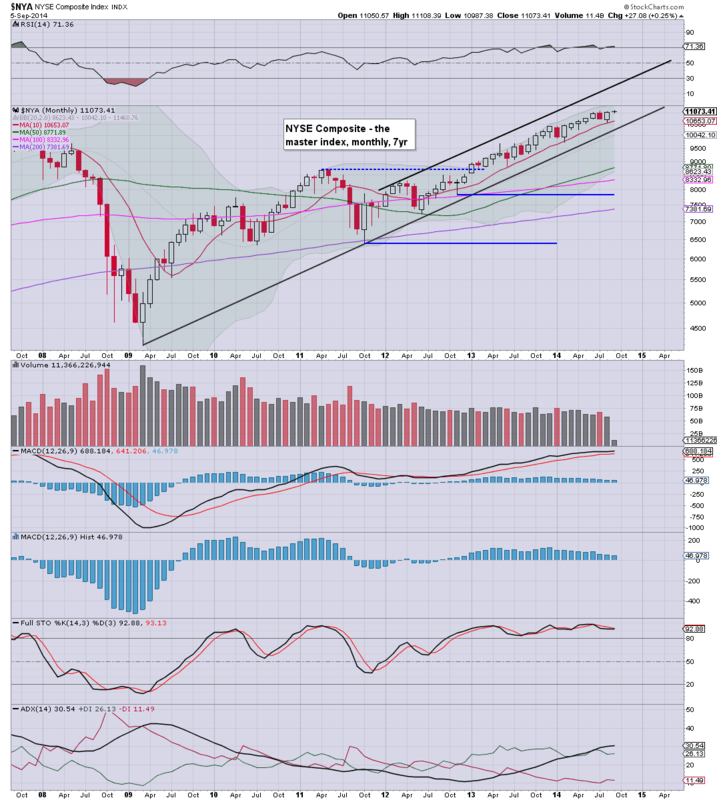 US indexes saw a latter day recovery, sp'500 swinging from 1990, settling +10pts @ 2007. The two leaders - Trans/R2K, settled higher by 0.6% and 0.3% respectively. 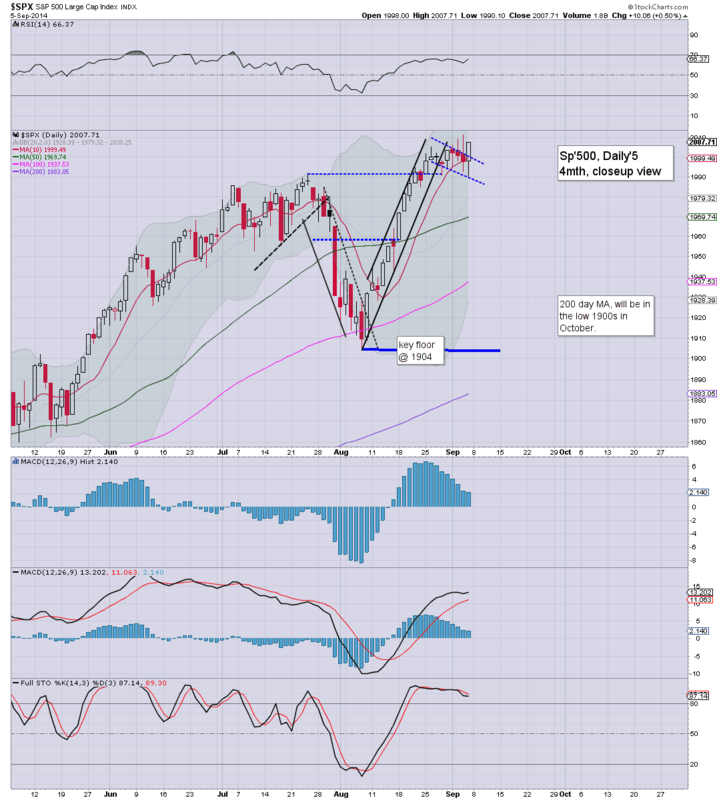 Near term outlook offers the sp'2030/50 zone. Notable gains in the 'old leader' - Trans', breaking into the 8600s. There looks to be upside to 8700/750 across the next two weeks.